I got this from Lou at Guitars 'n Jazz in Summit, NJ, USA. The guitar arrived on time from Fedex. After letting it acclimatize indoors for several hours, I opened the box. 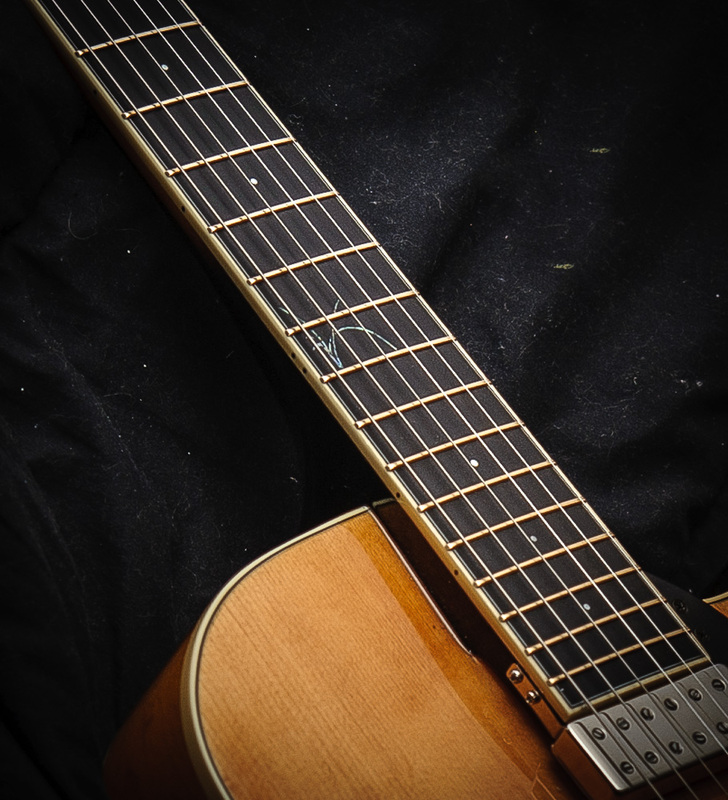 The string tension was lessened and paper plus packing lie between the strings and the fingerboard. Bits of packing and bubble wrap supported the guitar within its case. The case itself was sealed up and then wrapped in bubble wrap. Then, the cushioned guitar case was placed inside a stout cardboard box. Got to give Lou and his crew 10/10 for packaging – I felt impressed by their packing job. My first impression once holding this guitar was: wow, is it ever small and light. At 15 inches wide and 2.75 inches deep, this guitar just cradles in your arms. It plays/feels very comfortably with a low fatigue factor. In fact, I can’t seem to put it down. No problem practicing >=3 hours per day on this axe. The woodwork, binding and finish looks OK. 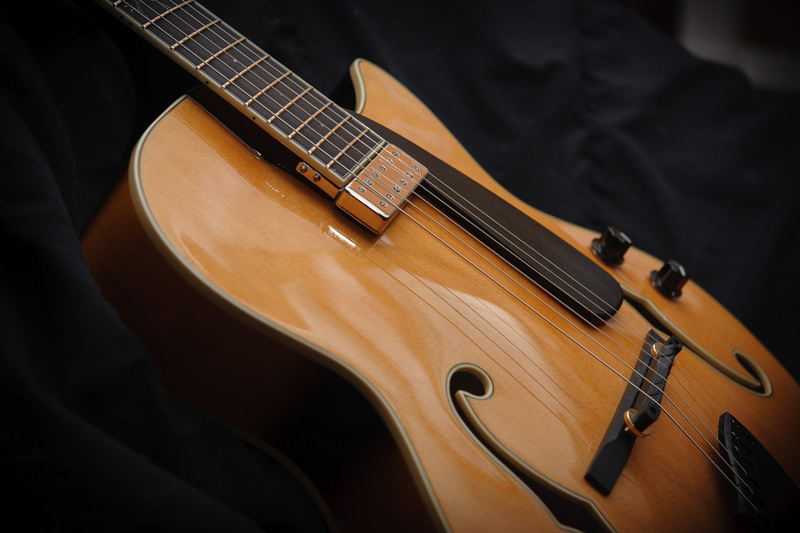 This guitar plays like butter – unlike some of the vintage relic guitars I’ve tried over the years. It feels like playing a Les Paul with heavier gauge strings. It took me some time to mentally ingrain fret navigation as the fret markers are located on top and not in the fret space -- that coupled with the shorter than typical scale. 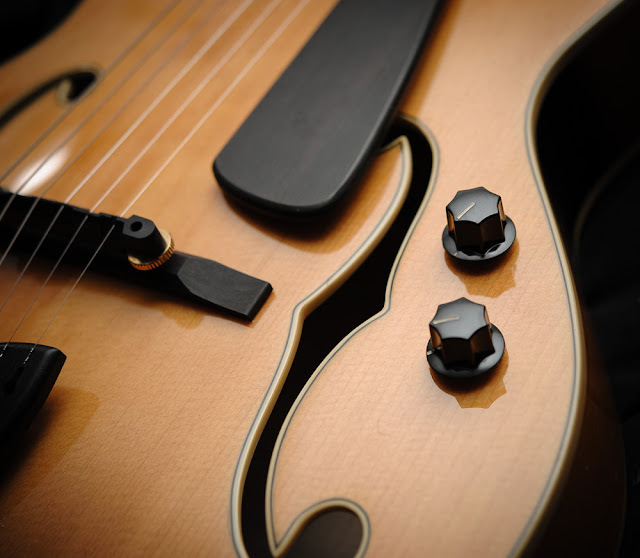 The ebony fingerboard looks jet black. The frets seem well polished and I haven’t noticed any nut, fret or bridge buzz. 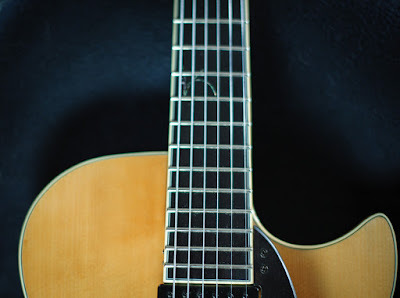 The wide fret board feels very nice when going finger style. 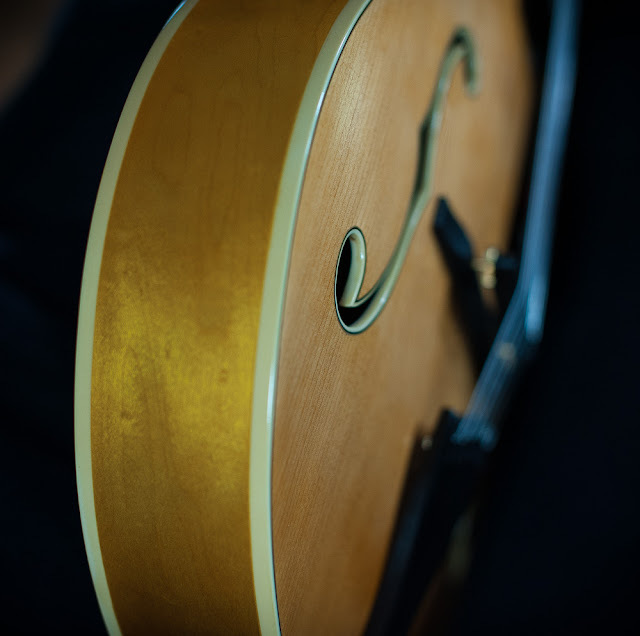 With its solid top and small size, this guitar sounds bright acoustically. However, amplified, I’m able to get warm tones with no muddiness on the bass notes. 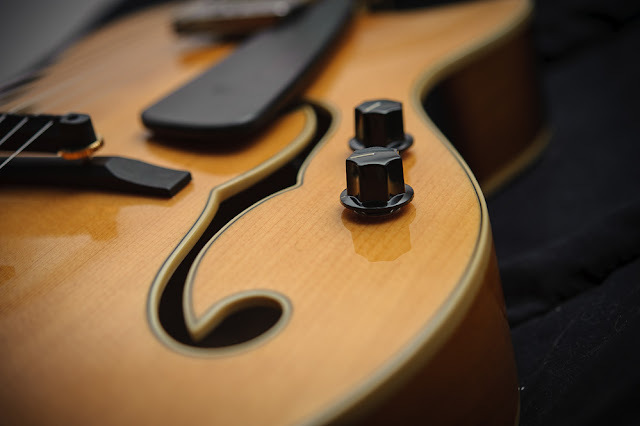 The fundamental tones sound extremely clean and pure – pristine notes with a fast, woody attack – exactly why I wanted this guitar. 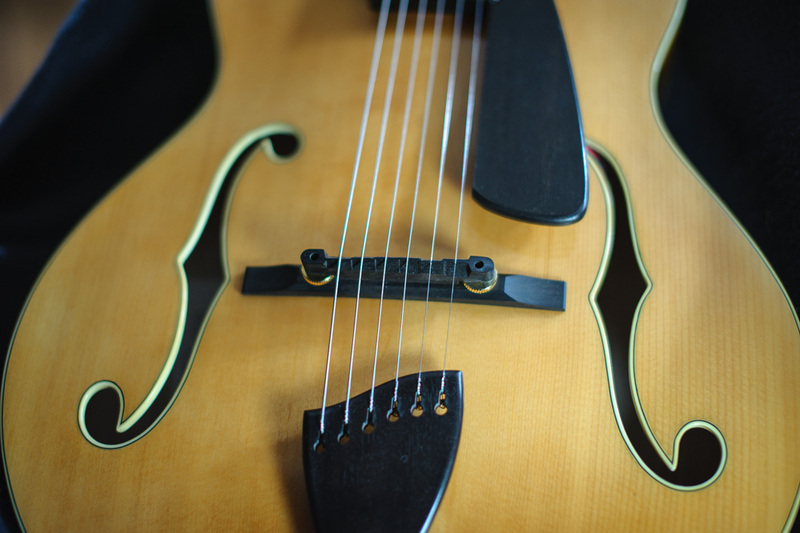 Overall, I hear a brighter, resonant woody tone reminiscent of most solid top archies. I know some players prefer laminated top guitars for a subjectively more “wooden tone”. The solid versus plywood top debate proves endless. Get at least 1 of each might be the ultimate answer to that debate. I saw and heard few negatives. 1 concern: I had to tighten the nut holding 4 of the Grover tuners as they were just barely hand tight. I noticed this during my first string change. I also wish the pick guard was a little lower, it's height gets constrained by the need to fir the volume control circuitry underneath it. 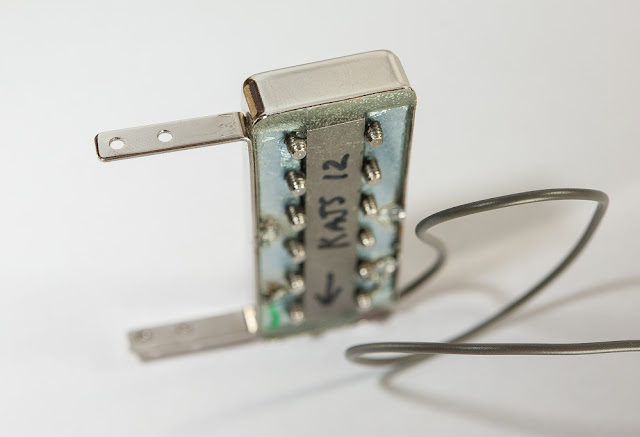 This guitar lacks a tone control circuit, but by lowering the volume pot, you roll off the highs enough that you can get by without a tone control. I also dislike a bridge pickup, switches, and 2 pairs of pots on my arch tops - so you now understand my bias. 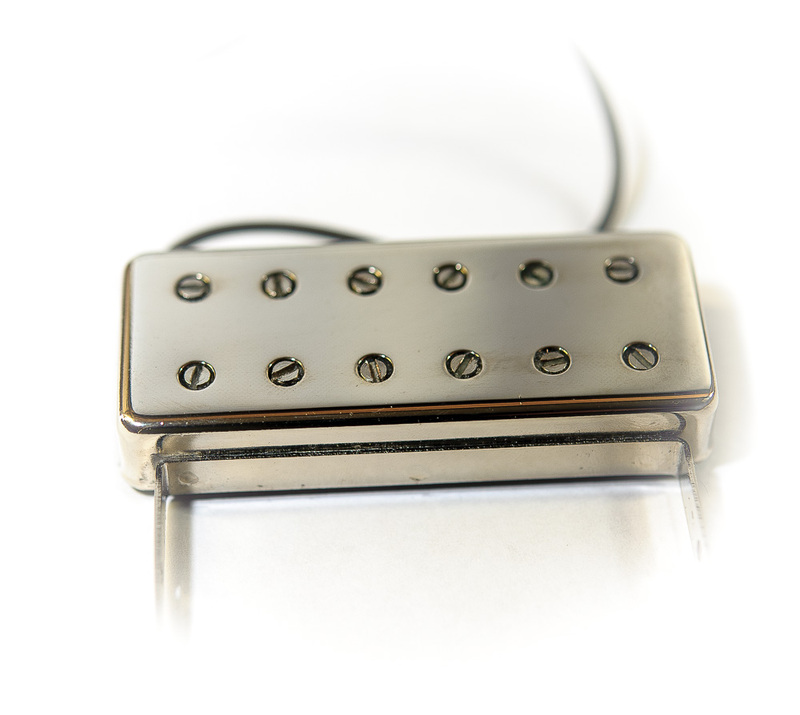 The Eastern Asian Kent Armstrong neck mounted pick up features an Alnico 5 magnet and reasonably compliments the clear sonic tones emitted by the Maestro. 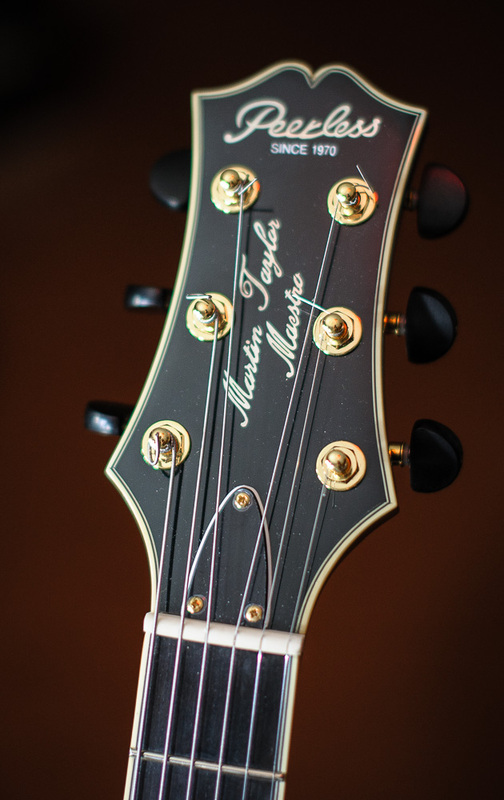 The ebony string trapeze contains a wire to ground the strings. It's quiet plus free of hum and also surprisingly AF feedback resistant. The Peerless Martin Taylor Maestro sounds lovely and plays beautifully -- if a 15 inch, shorter scale guitar is your cup of tea – it's worthy to consider. 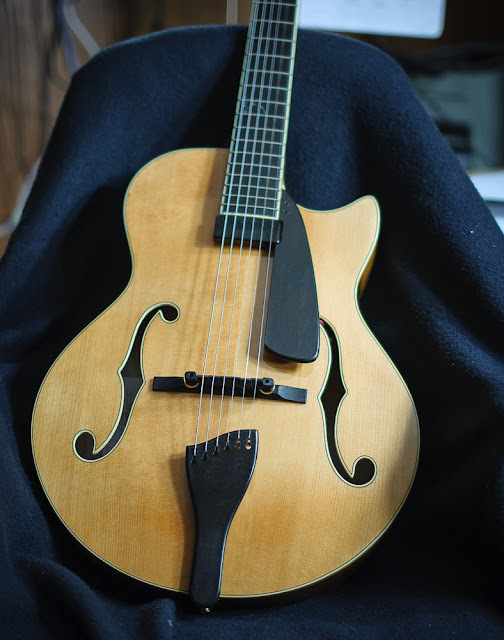 In October 2018, I modded my Peerless Martin Taylor Maestro. I'll show some photos and such. 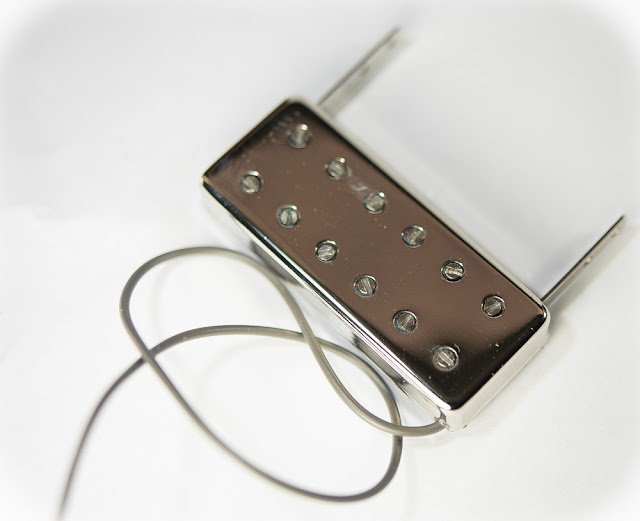 I bought a new, floating pickup wound personally by Kent Armstrong in Vermont U.S.A.. Above —Bottom of pickup showing Alnico 5 magnet. The adjustable pole pieces come in handy. I better balanced my amplified sound by lowering the B and E string poles since these strings were too loud compared to the other 4 strings. 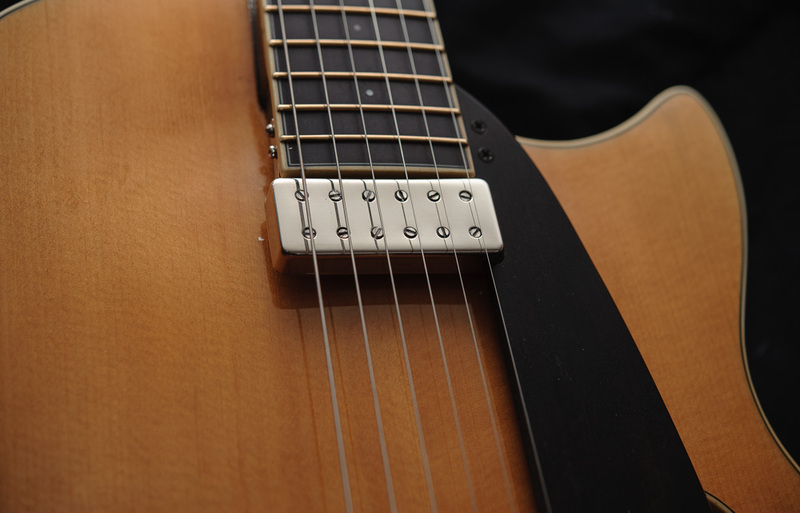 I also raised the G string poles slightly. 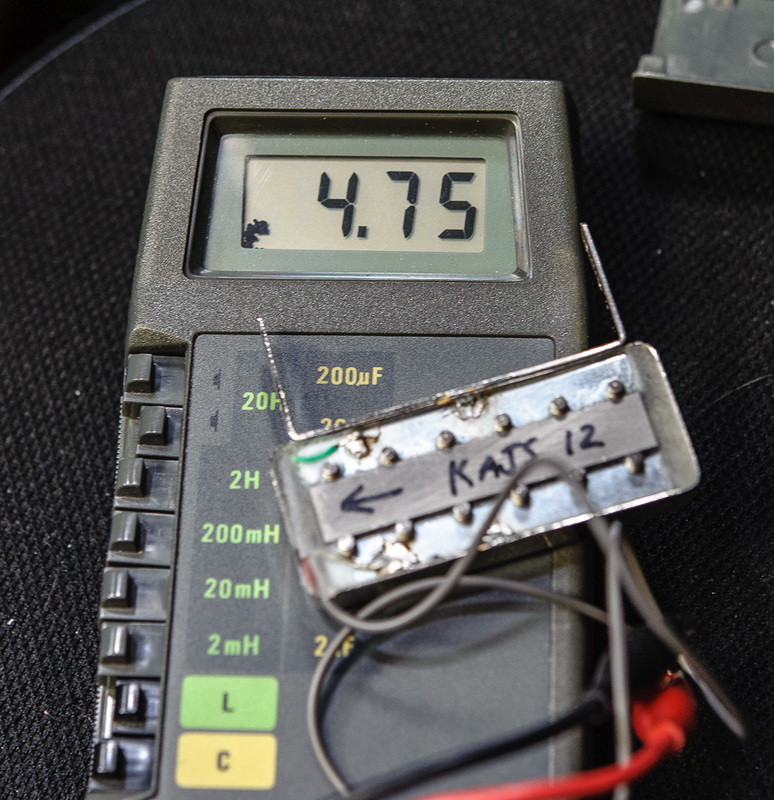 Above — Measured inductance in Henrys. Above — Measure DC resistance. 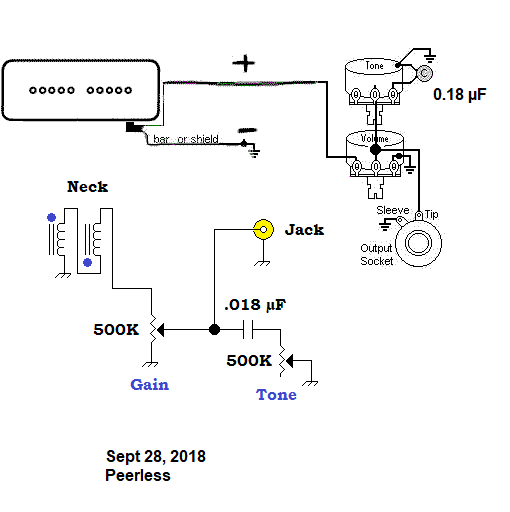 Above — Here's the schematic I gave to my luthier Gary. 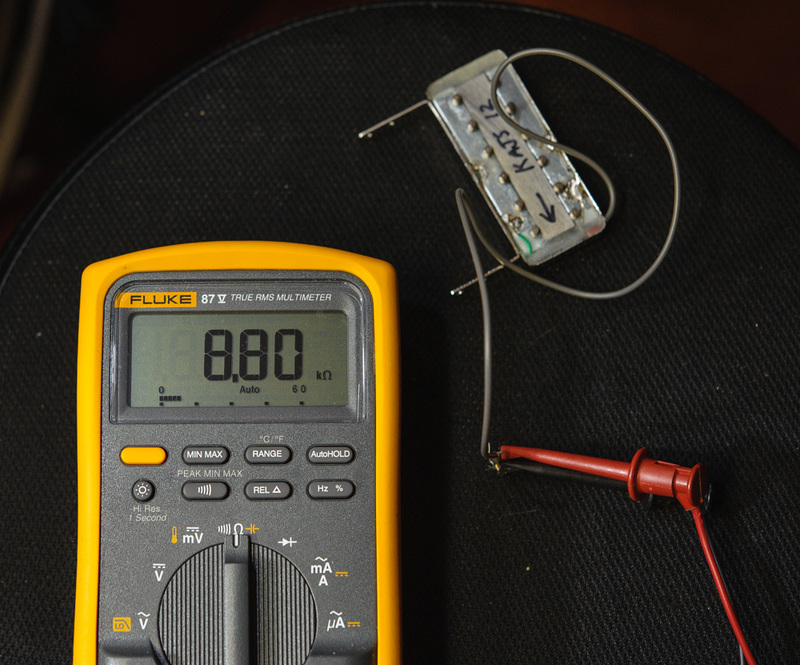 I chose a vintage style tone network employing a 0.18 µF polyester tone capacitor. He used new 500KΩ CTS pots and I supplied the capacitor from my parts collection. 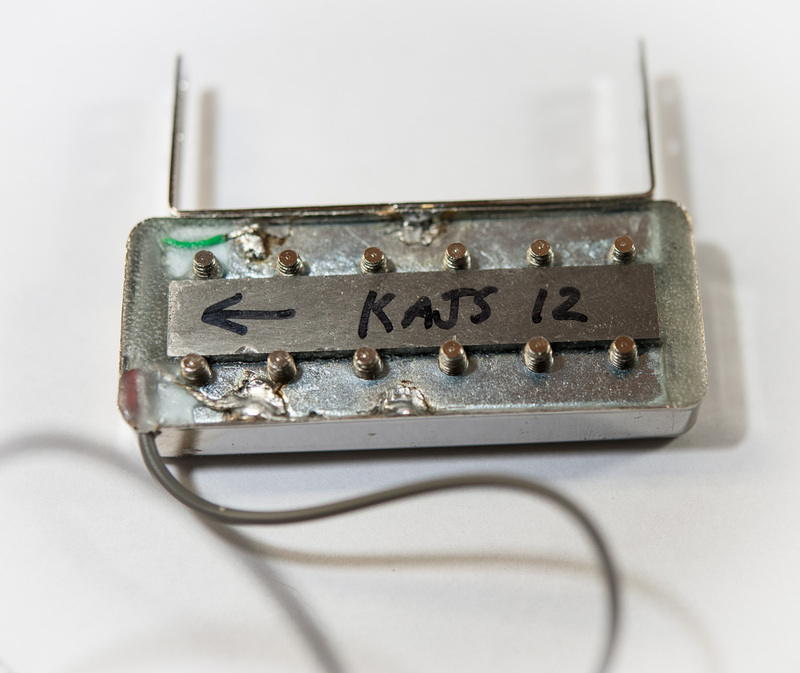 I prefer having regular size volume and tone pots as opposed to thumbwheel pots often seen on neck-mounted pickup guitars. Above —The modified Peerless Martin Taylor Maestro: now with body mounted volume and tone controls. Since the pick guard no longer has to support a thumbwheel volume pot, he lowered it closer to the archtop and it seems more enjoyable now. 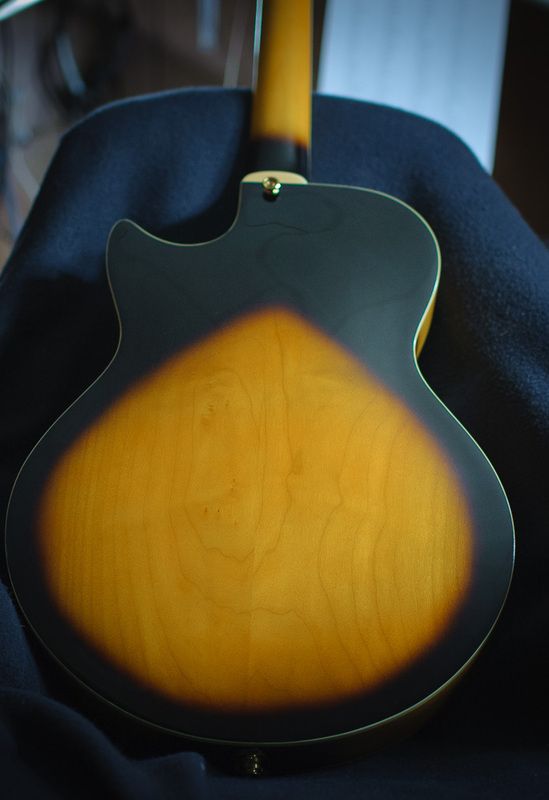 Gary had to carve out the pickguard to accommodate the slightly larger hand wound pickup. Above — Gary also did 1 of his his amazing set ups on this guitar. This included fret and bridge work. I also asked him to implant small, mother of pearl fret markers into the fingerboard in the standard slots. 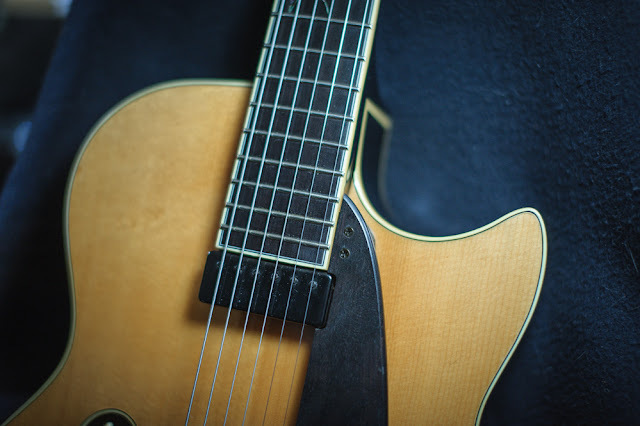 This boosts fret board navigation and is especially helpful when you change from a long scaled guitar to this short scaled jazz box.